It is with great sadness that I let you know that Vera E. Jansone, a longtime OWA member, passed away on March 12, 2004, at the age of 88 years. Vera was born in Riga, Latvia, to a family of doctors with her parents being ophthalmologists. "Since she was talented in mathematics and sensitive to the arts," Vera wrote about herself in a 1987 curriculum vitae from which I will quote, "she decided to study architecture. After a few years at the University, she participated in an architectural competition, won the first prize, and set out on a journey to Prague, Budapest, and Italy." This was just the first travel in her life full of traveling throughout the world. After "V" Day, Vera arrived in Paris with one suitcase and with a firm belief to become an architect. She continued her studies with LeCorbusier and at the Ecole Des Beaux Arts. Life in Paris was extremely hectic: work all day, study all night, attend concerts of the best musicians and dancers of the world, Sundays play tennis and during Summer vacations climb the Alps and Pyrenees with the Club Alpin Francais. Together with one young man only, she ascended the summit of Mount Blanc - the higher the closer to the almighty God. At the Beaux Arts, she belonged to a small group of young architects from the Atelier Auguste Perret, who were fighting for the true Modern Architecture, based on the principles of Le Corbusier. After graduation at the Beaux Arts with a degree of "Architecte DPLG," Vera was offered to become an Associate with J.L. Humbaire, in his office in Paris. Previously she had been working with him successfully on several school and college projects. This proposal had to be delayed, because soon after she was granted a scholarship to the United States. Vera came to Chicago. After three semesters at the Illinois Institute of Technology with Mies van der Rohe, she obtained her M.S. in Architecture. and with other San Francisco Bay Area architects, mostly on big scale commercial, institutional and multi-family residential building projects. In 1952, she married Frederic de Fisher and had one daughter, who followed her mother's family tradition and became a doctor. Vera and her husband lived in Greenbrae, Marin County, in a house, which she had designed and built in 1976. Although her work was mainly in large scale projects, this house, cantilevered over a steep hill, demonstrates Vera Jansone's commitment to the International Style, her boldness and candor. The sketch is from the booklet of the 1985 OWA House Tour to Residences Designed by Women Architects in Marin County and Napa Valley. I would like to call your attention to an important new and useful book by one of our former member Alison Kwok , titled The Green Studio Handbook. UC Berkeley for a Ph.D. in Building Science-a perfect combination of technology and design. and is now a tenured professor at the University of Oregon. She co-authored the gigantic book, a bible, for architectural students titled Mechanical and Electrical Equipment for Buildings. The recent 10th edition, adds her name to this well-respected reference book. "magic arrows", and to provide a resource of ideas on how the strategies are used in place, visually. 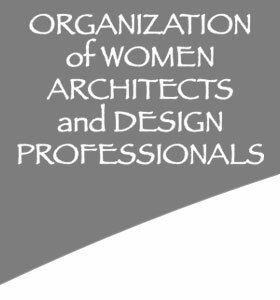 Co-authors Alison G. Kwok, a University of Oregon Professor of Architecture and Walter T. Grondzik of Florida A&M University, a former visiting professor at the University of Oregon, collaborated on the book in its early stages through a technical teaching seminar at the University of Oregon. The book contains 422 full-color photographs and line drawings illustrating the application of green strategies during the schematic design of buildings. the bulk of the book includes 40 environmental strategies (e.g. green roofs, shading, permeable surfaces, passive solar design), with brief descriptions of principles and concepts, step-by-step design procedures, annotated tables and charts to assist with preliminary sizing, as well as a summary of key issues to be addressed and references to additional resources. Nine case studies selected for geographic diversity and a range of building types are also included to show how it all goes together. Practitioners, students, faculty and even the lay public will find this useful to help understand implementation in schematic design. Our flight was totally full and we had a short stop in Hong Kong Airport before continuing on to Ho Chi Minh City. We arrived at 10 in the evening and the temperature was a pleasant 58?. We are staying in this wonderful French Colonial Hotel facing the Saigon River. There is a fairly wide promenade along the river. Hundreds of barges hauling sand, logs, and other heavy materials travel up and down the river all day long. Traffic on the river is more dense than on the motor roads! May is not the hottest month in Vietnam, March is usually hotter. June and July see a lot of rain. We had a little rain shower late in the afternoon. Within Ho Chi Minh City the vehicular traffic is not terribly congested. Cars cost about two and one half times more than they do in the U.S. The people that can afford cars like to buy Japanese or German cars. Most people travel by bus or ride a moped. There is a lot of pedestrian traffic. The most impressive feature about the city is the very wide sidewalks that follow the Parisian model. Sidewalk cafes are popular. The city is not that large and quite manageable on foot. 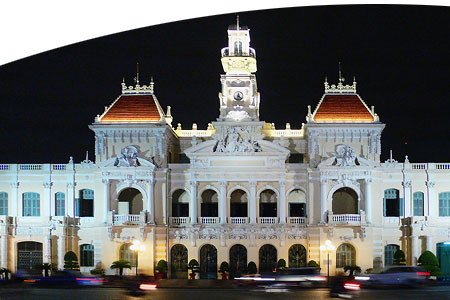 The City Hall building is another good example of French Colonial building style. Most housing stock is new since 1976. The members who came to the June event at StopWaste.org got a personalized tour and presentation by OWA member Karen Kho and her colleagues at this innovative organization. They practice what they preach. We were asked not to bring beverage cups as they already had enough and didn't want to add more waste. A small but an important detail. They renovated instead of building anew, chose a location near a Bart Station, dedicated a parking space for a car-share vehicle, and offer secured bicycle parking. They started out striving for LEED Silver, one step above the basic certification. Initially they wanted to show how green building principles could be applied to an ordinary building with a typical design and construction budget. Early on they realized they had bypassed Silver and were well into the Gold range. From there they made the commitment the spend more money and a lot more effort to go for the top: LEED Platinum! They produced a carbon neutral building that uses a minimal amount of water. The energy savings exceeds 40% compared to a similar conventionally built and run building. The OWA Annual Retreat is next month! If you have not signed-up yet please do so ASAP. This year's theme is Sustainable Careers. The retreat will be held again in Sonoma County at the Westerbeke Ranch on Friday September 14 through Sunday September 16th. Annual Holiday Donation: I know a lot of you were very vocal at last year's party when we asked for a ratification vote. To date that money has not been awarded to any charity. At this meeting we will be looking for a vote on IF we should donate money at all. 2008 Calendar: While the Steering Committee is working on next year's calendar we want to hear which programs you especially liked, do you want more tours, presentations, all architecture or life issues (e.g. Estate Planning). What would you like to see or hear? New Steering Committee Members: We strongly encourage any members, new or long time who have an interest in serving on the SC to attend and let a member(s) of the SC know of your interest. Some of the roles on the Steering Committee are: Newsletter Editor, Website Editor, Event Photographer, Event Host, Meeting Minutes Recorder, and other one-time roles. The time commitment is manageable as we meet for couple of hours every other month. Each Steering Committee member is responsible for organizing one calendar event. Of course we help one another as we can. So please mark your calendars for this meeting. Let us hear from you! See the complete 2007 calendar here.